3 1/2 yards of Cambridge Common by Design Concepts for Free Spirit. 1. Leave a comment answering this question: Which new quilt-related skill would you like to learn in 2013? This giveaway will close January 31, 2013 at 5pm. The randomly chosen winner will be announced on Friday, February 1, 2013, here on this blog. I will ship internationally, too! Get typing, and good luck!!! Am I the first? wooooo! I always use machine so I'd love to learn how to hand quilting.. Many thanks for the great giveaway! I am still hoping to learn more FMQ skills...I am better, but far to go!! This year I hope to really get binding down good & tight! It's quite a challenge for me & I don't want to do any of it by hand! Fun giveaway! I want to learn hand quilting this year. I am a follower...thanks for the chance to win this fabulous fabric!!!! I would like to learn to to do curves and to stretch my skills by making bigger quilts. I would love to learn how to quilt freehand feathers!!! Also how to make a bargello quilt...that will be learned at a retreat next week:) yea!!! I would like to learn how to bind better. Love the fabric and thanks for the really great giveaway. I hope it's ok if I say there isn't any new quilt related skills I want to learn. NO! I'm not perfect and know them all already, trust me. LOL What I want for this year it to improve on what I have learned to date since I began quilting a couple of years ago. If I add more to what I have a struggle with already then I will just frustrate myself. Does that make sense, I hope? That fabric is just beautiful. Thank you for the chance. I am already a follower of your blog using GFC as well as via email. I need to say I need more help with Foundation piecing. I would also like to learn to make my own patterns with this method. This is the year that I learn how to do paper piecing. I've been admiring hexagon quilts for a long time and I figure if I start smaller, maybe a mug rug or placemat, then I can get the hang of it! I am still struggling with free motion quilting! I am learning to quilt, so ALL of the skills of quilting is what I am going to learn this year :) And I can't wait! All my supplies are here, so I can start cutting my fabric!! I'd like to learn curved piecing! I would love to learn hand quilting. Thanks for a great giveaway. I am new to hand piecing and quilting and I would like some pointers on both. Thanks for the give-away. I hope to learn EPP hexies this year. I'd love to learn how to make wonderful FMQ feathers and other designs besides meandering. I would like to learn needle-turn applique this year - and how to do machine applique too. Great fabric - terrific giveaway! I would love to make feathers and circles. What a lovely giveaway! paper piecing would be new, but I'm a little scared of it. I really would love to get my hand quilting straightened out. Denise, thank you so much for the opportunity to win this gorgeous fabric. I would so love to learn how to inset seams. What a great giveaway! I would like to learn to paper piece! That's my 2013 goal! I'm a follower by google and email! I would like to work on my needle turn applique.... Thank you for the great giveaway! Thanks for the chance, I hope to learn scalloped edges, I am working on a quilt top that a scalloped edge would be perfect. I would like to learn FMQ, thanks for the giveaway! I want to try FMQ. Thanks for the giveaway! Where to start really. I would love to really get to grips with FMQ. I also want to work on paper piecing and my mitred borders need some help. I can do the mitred binding without any problem but seem to make a mistake on the borders. The giveaway is lovely. I'm currently making my first ever quilt, so all quilting techniques are new to me! I'm hoping to make two quilts this year, and learn a lot with both of them. 1. What I've been trying to learn is how to do fusible applique and to blanket stitch around the edges. I think it is called blanket stitch anyway. I'm still wanting to learn more about FMQ skills, I'll have to make some small pieces to practice on. that is gorgeous! paper piecing..I would love to learn how to do that and well free motion quilting. I want to improve my FMQ skills this year. I would love to learn foundation piecing! FMQ is my 2013 challenge~! I want to learn to machine quilt. I am always in a hurry so I have to slow down and practice! Thanks for the giveaway! I want to do paper piecing. I know the theory but to sit down and actually sew something is my goal. I'd love to learn to FMQ. Great giveaway! I am determined to learn paper piecing this year! I am terrified of FMQ. I know you have to practice and when I do the threads are all pulled and you can see the bobbin thread. So I stick with straight lines. Even with straight lines they are crooked. Thank you. I am a follower of yours. Thank you for the Chandler to win this fabric. I guess it would be to learn more FMQ techniques...and tips and techniques.. I am always looking for easier or new ways to do things. I would like to learn how to paper-piece. Paper-piecing is something new I'd like to learn in 2013. Gorgeous fabric! I would like to learn more fabric folding techniques like flowers or cathedral windows. I would like ti improve piecing skills for little blocks! I swear I say this every year, and eventually I will follow through - I am a hand quilter who wants to learn to machine quilt. Thanks for the chance! I follow by email. Your giveaway is wonderful! Free motion quilting with a domestic sewing machine. It will be great! I want to learn to bake cupcakes and biscuits using fondant. Thank you very much for the giveaway! Hi Denise: Thanks for the email about this great giveaway. 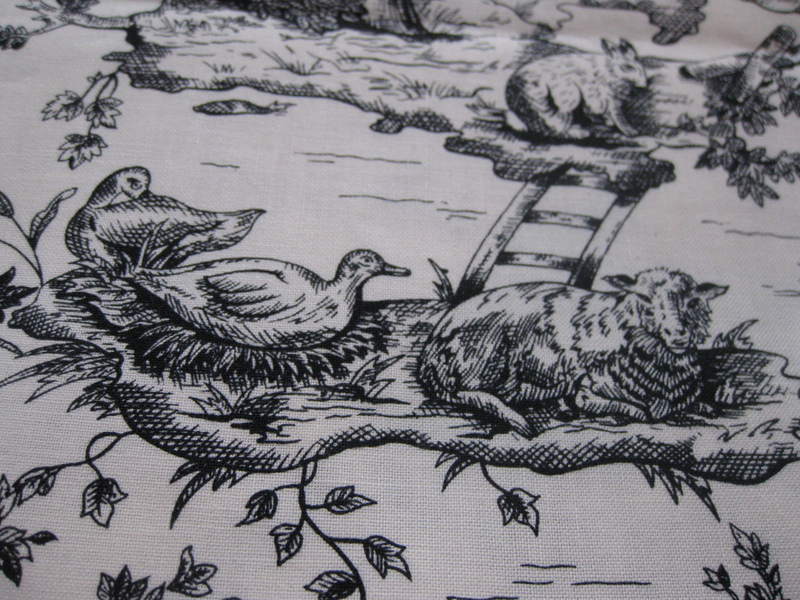 If I'm the lucky winner I may re-gift it because I have a friend who is a toile fanatic! This year I am going to try to quilt a really big quilt on my home sewing machine. And I'm a follower through Google Reader. I would love to learn how to actually finish a quilt without it being a huge, insurmountable feeling ordeal! Seriously, I have SOOO many quilt tops and I am SOOO bad at finishing them! That prize fabric would make a SWEET backing for something! And of course I follow, which is how I know about your giveaway! Thanks for the giveaway! I'd like to learn how to bind better, especially corners. I've been following for a while by email but today I hit your join me button in the sidebar. I would love to learn applique better. Thanks for the giveaway. I would love to learn how to put on a square mitred binding... I want to enter some quilt shows and this is crucial! I would love to learn FMQ! I tried it a tad last year and well I would like to learn! I need to try my hand at english paper piecing. Thanks so much! I would like to learn p[aper piecing this year. I have done very small craftsy things with it, but not a quilt. I would like to try free motion quilting. Thanks for the giveaway. I want to learn to hand applique. I receive your emails, but now I've signed up with GFC. Free motion quilting, just can't get the hang of it. I would love to learn free motion quilting. I have a little experience, but I need a good machine to really practice and achieve those beautiful designs! I'm a new quilter and I would love to learn free motion quilting. This is the year!! Thanks for a lovely giveaway! I follow you by email. Thanks for a lovely giveaway! I'm a follower, via GFC and Google Reader! Thanks for the chance! I want to design my own quilts rather than follow a pattern. I want to learn hand quilting and applique this year. Thanks for the great giveaway. I would like to learn paper pieceing in 2013. I have seen some really cute things made with that technique. I am a follower through e-mail. I'd like to learn applique. Thanks for the giveaway! I would like to perfect my edging. Every quilt I make has something wonky around the edge which I "artfully" try to cover up with bias tape here and there. Thanks for chance to win your Drawing!!! I would like to learn how to put color together. It seems simple but I always stress out about it. Some tips? I'm a slacker and have yet to learn paper piecing but I want to this year! I would like to learn FMQ this year! This year I would like to improve my corners and precision sewing and I would like to build my confidence with quilting small projects. I would love to learn free motion quilting. I'm looking forward to learning how to quilt as you go this year through the skill builder BOM. I follow you by email. Keep those great posts headed my way! Thanks for the giveaway! I'd like to learn free motion quilting but there is no one in this part of the world to teach!!! I hand quilt as a result which is very time consuming. I NEED to learn free-motion quilting and am bound and determined to do that this year. Thanks for the opportunity to win your giveaway. I'm a follower. Thanks for the opportunity to win your giveaway. I want to learn how to machine quilt - so far I have only been doing hand quilting which I love but it is rather slow! I am a follower! 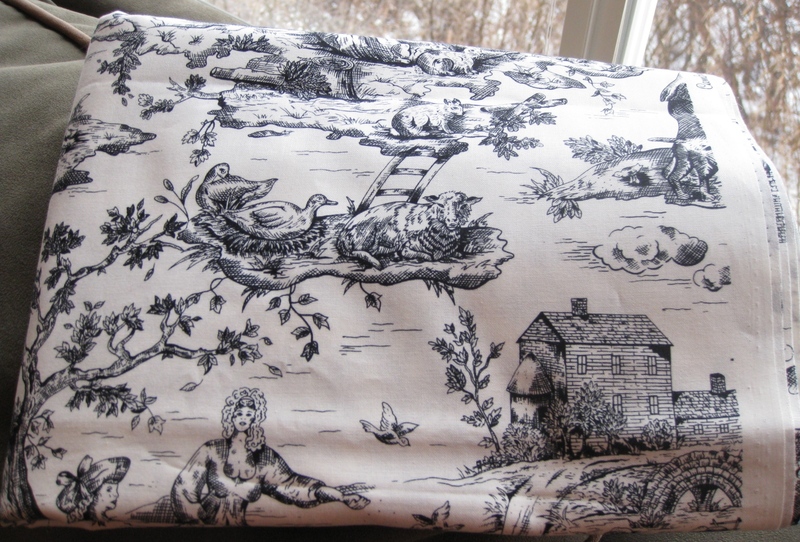 I would love to win this fabric because I lived in Cambridge for 7 years - so many memories! Thanks for the giveaway. I plan on trying needle turn applique! I think hand quilting would be a good idea, I mean, I know you put a needle in and out.. But my first Big quilt for my bed, I want hand and machine quilting. I really want to learn to FMQ. I now have a machine that might make it easier to learn. I am also a follower and I love toile! I would like to learn to paper piece this year. I am taking a class at Quilt Con in February to learn how to do it with freezer paper! I would love to learn more about FMQ! Thanks for the giveaway - lovely fabric! I would like to learn a little bit more about applique but mostly I want to continue to experiment with bargello and some free motion quilting. 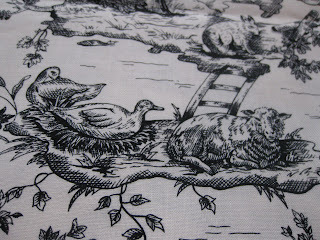 Thanks for the chance to win such a lovely toile fabric. I am a follower of your blog and get your posts on my email too. There are so many things I want to learn. I think applique is on the top of the list. Quilting - any kind, free motion, straight line, machine or hand. I am happy with my piecing now but not so happy with how my quilting looks. My ambition is always far higher than my ability haha. I expect to be able to quilt like Angela Walters despite having very little experience haha. This year I need to learn a whole lot of quilt related skills as I am hoping to make my first proper quilt. This Christmas just gone I made my first basted, backed and bound wall hanging which was a whole lot of new skills to self teach myself. I also did my first Hexi's. I loved the challenge & am looking forward to doing more. I've only ever made rag quilts, so I have many quilting skills to learn...all of them! Completing a "real" quilt will be quite an accomplishment for me. I'd like to try handquilting. I haven't done any quilting by hand yet. Hello from Minnesota! This is my second year of sewing so I'm really interested in learning more about sewing machine maintenance and how to draft a pattern to share on the computer. I'm also a follower. Thanks for the giveaway! Hello! Well, I decided to tackle sewing curves as my first new skill of 2013 and I signed up for the curves class with Rachel over at Stitched in Color. It's making me feel so productive to learn this in the first two months of the year! I want to learn FMQ better. I am a follower to your blog. Lovely giveaway,thanks for letting me know.I would love t learn hand quilting. Nice giveaway. Want to start a quilt using black and white as the main focus, and this would add nicely to that! I would love to learn how to machine quilt. I've done most of the tablerunners, quilts etc by hand, and if by machine, only in the ditch, or about a 1/4" from the stitching. So would love to learn freemotion quilting. Thanks! I Need to practice my free motion quilting, and I just signed up for a Art Quilt class which uses tiny little pieces of fabric to create a mosaic.